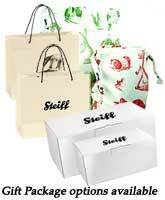 At Ashby Bears, we offer a range of Steiff gift packaging to go with your chosen product. Most "white tag" Limited editions, already come boxed, although not all of them. If there is a Steiff gift box, or a luxury Steiff cotton bag available, you can select it here by opening the drop down box and selecting your chosen item. your purchase will then be supplied together with the additional gift packaging option. International purchasers, Please note that the gift box option will usually make the shipment too large to be sent by standard UK Postal service and therefore make the shipping charges very expensive by having to use International couriers e.g. Fedex. With this in mind, we suggest that you keep to the cotton bags as your packaging option.